1. Heat the oven to 220C/Gas 7. In a bowl combine the shallots, oil, vinegar and thyme and season well. Swirl everything together so the shallots are well coated then tip into a roasting tin covered with foil. Cook for 20 mins in the centre of the oven then remove the foil and cook for a further 20 mins. Spoon the caramelised onions out onto a plate and set aside to cool. 2. Using a circular pastry cutter, cut 15 disks out of the flat breads then mound some of the shallots on top. 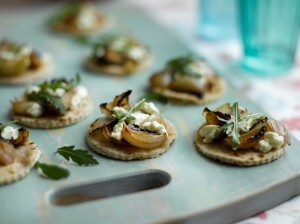 Crumble some goats cheese on each one and grill for a minute or two until the cheese melts slightly.